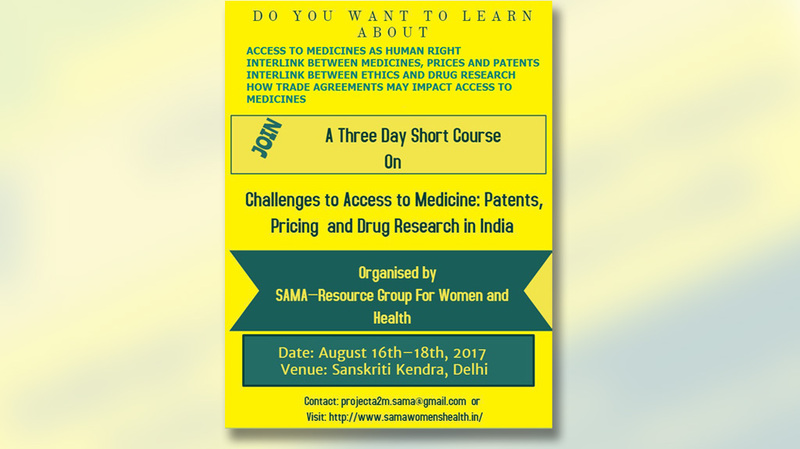 We are happy to announce that Sama is planning a three day short course on CHALLENGES TO ACCESS TO MEDICINES: PATENTS, PRICING AND DRUG RESEARCH IN INDIA from 16th to 18th August, 2017 in Delhi. This short course is expected to provide key inputs on some of the most critical issues in the domain of access to medicines in India. The course will broadly cover the issues around – Access to Medicines in the framework of Public Health and Human Rights; Ethical Issues in the context of Access to Medicines and Drug Research; Connecting with ground realities; Drug Research, Drug Pricing, Patents and Trade Agreements. This interactive short course may be of particular interest to ethics committee members, health professionals, legal professionals, researchers, academicians, students, health activists working in the field of public health, drug research, access to medicines and bioethics. However, the course is open for participation to anyone who may be interested.